There’s nobody trainer Lloyd Kennewell trusts more to get the job done on classy mare Viddora in Saturday’s $13m TAB Everest (1200m) than jockey Joe Bowditch. That’s hardly a surprise when you learn they have over 20 years of friendship behind them and regard each other as family. “Right from the start we got along really well, even though I was a bit younger, we had a good relationship and that extended into our work life,’’ Kennewell said. Originally from Wagga, Bowditch started his apprenticeship in Sydney with Ray Guy and in 1994 rode his first city winner at Randwick before taking up an opportunity to ride for David Hayes in Adelaide. Some 10 years after they met Bowditch rode Kennewell’s first winner as a trainer, a former Kris Lees mare called Treasure Time, at Cheltenham in 2004. 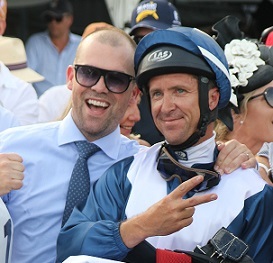 On Saturday, Bowditch, now 41, will return to Randwick trying to win Australia’s richest race for his best mate who has never had a starter at Sydney's premier racecourse. 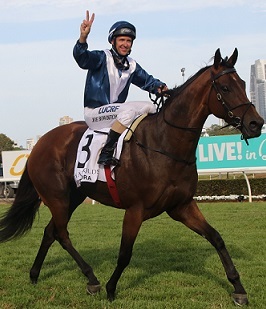 Viddora earned her spot in the TAB Everest with her dominant first-up win in the Group 1 Moir Stakes (1000m) at Moonee Valley, just two weeks ago, after she was selected by slot holder Damion Flower to replace the now retired English. Bowditch has ridden the six-year-old in 21 of her 27 starts and in both her Group 1 wins – and Kennewell wouldn’t have it any other way even if it meant possibly losing an owner. “Over the years as I’ve been growing my clientele and travelling to Melbourne and back, a few have said ‘who is this Joe Bowditch’ and I’d say ‘Joe rides them or you can pick them up’ basically,’’ he said. “We’ve had great success and this industry is built on relationships. What I get with Joe is 120 per cent every time he goes around. It’s a great loyalty we show to each other. Such is the strength of their working and personal relationship, when Kennewell moved his main stable from Adelaide to Melbourne prior to the start of this season Bowditch made the move too. Viddora gets her REDEMPTION in the Moir Stakes. What a win! Kennewell, 35, describes the jockey as a no-fuss, low key, person who likes to live in his comfort zone. And that’s part of why he has the utmost faith when it comes to riding Viddora in the biggest race of their lives. “He’s very level headed, when we go away there’s no real fanfare. He just wants to get the job done,’’ Kennewell said. After working Viddora this week Bowditch said she couldn’t be in a better place for her stiffest test to date. He rides her work just about every morning and is happy enough going into the Everest underestimated. “She’s flown under the radar a bit but she’s not a pushover, I think they will know she is there,’’ Bowditch said. “I’d like to get a bit of cover at some stage, in the first 600m, then she can turn out really good sectionals. Following the barrier draw, Viddora was a $15 chance with TAB despite coming off a Group 1 win though as everyone knows the market is basically a logjam with three $7 equal favourites. Not many trainers are beaming when their horse draws the outside in any major race, let alone one worth $6 million to the winner, but Kennewell is more than happy to cop the ‘visitor’s draw’. And he makes it clear he’s not here just to experience the atmosphere of The Everest. “I actually like barrier 12, in fairness I’m not worried about it,’’ he said. “Joe will take care of business and do what he’s got to do. She’s not a forward runner so 12 isn’t a hindrance to her, she’s going to be midfield or a fraction worse. “I’d rather be three wide with cover than four back on the fence. Check out all the fields, form and replays for Everest Day at Royal Randwick on Saturday.